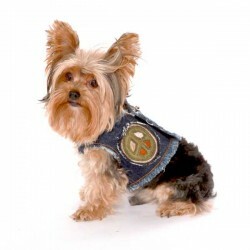 Find a fashionable and functional dog harness dress, dog harness tank, or dog harness vest for your dog or make it a perfect gift for a dog lover. These fashionable dog harness dresses and dog harness tanks are perfect for keeping your dog leashed and stylish at the same time. You can keep your pet safe and close by while still looking great. All of these dog harness dresses and tanks have a D-ring so yu can easily attach their dog leash.